Election 101: What is my constituency and who are the candidates I can vote for? Dawn.com helps you locate your constituency and discover your electoral options. In the last five years, the Election Commission of Pakistan (ECP) has registered nearly 8.1 million new voters. The voting process, especially for these 8.1 milion first-timers, can be a little overwhelming. As a voter, one of the most important questions for you will be who do I vote for? To make that decision, you first need to know which constituency your vote is registered in. A constituency, according to Britannica.com, is a "basic electoral unit" from which eligible voters elect a political representative to a public office. After each census, the ECP is bound by the Delimitation of Constituencies Act, 1974 to hold fresh delimitation for national and provincial seats' constituencies. According to the ECP, all constituencies for the general seats must be equal in population "as far as possible". Read more about delimitation and how constituencies are created here. The registration of voters takes place within the constituency they reside in, as recorded in their CNIC. You will only be allowed to cast your vote at a designated polling station in the constituency you are registered in. How do I find out which constituency I'm registered in? A common query that all voters have — especially after the recent delimitation — is which constituency their vote has been registered in. • The easiest way is to send an SMS with your NIC number (no spaces or dashes) to 8300. The Election Commission will send you details about which constituency you are registered in. • You can also visit the ECP’s website, where the body has uploaded the list of constituencies in each province after the delimitation. You can find your relevant national and provincial assembly constituencies here. • Alternatively, you can also visit the central or provincial ECP offices, where the lists of constituencies have been displayed. You can find the addresses and contact details of the ECP offices here. Who are the people contesting from my constituency? 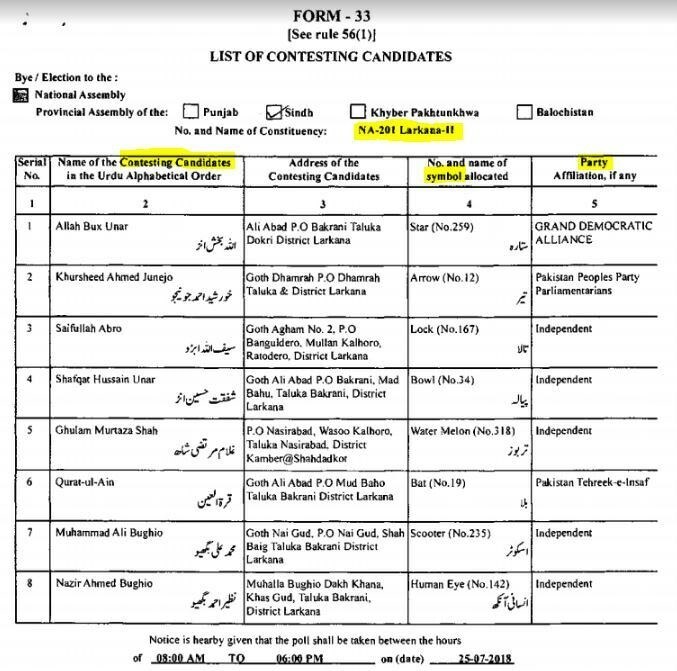 The finalised lists of candidates' names, complete with their party affiliation (or lack thereof) and electoral symbols for each constituency has been uploaded to the ECP website. When you click on the link, it takes you to a landing page. In front of your province, select 'National Assembly' or 'Provincial Assembly'. The ECP website landing page. A PDF document will open up. The name of each constituency is given right above the list of candidates. The red line shows where the constituency is mentioned. Scroll down to locate your constituency and find your candidates. The list of candidates from NA-201 Larkana-II. Important fields highlighted. These lists can also be viewed at the ECP's head offices. You can also see a complete list of symbols that have been assigned to each political party here. 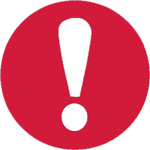 A list of symbols that have been assigned to independent candidates can be found here. Polling stations are the venues where voters go to cast their votes. There are multiple polling stations within a constituency. The ECP sets up polling stations in government buildings, schools, private offices etc. According to the ECP website, "efforts are made" by the body to "assign the voters to the nearest polling station". However, a polling station may be as far as two kilometres from a voter's registered address. This time, the ECP has initiated a geographic information system (GIS) polling scheme under which the body has released lists of polling stations in all constituencies so that voters can check the venue they are supposed to go to in order to cast their vote. There are three ways for you to find out which polling station they are supposed to cast their vote in. • By sending your CNIC number (without spaces or dashes) to 8300. ECP will send details of your electoral area, your polling station and your constituency. • By visiting the ECP website where the GIS polling scheme lists have been uploaded. • By visiting the relevant RO's office or any of the ECP head offices, where the lists have been displayed. Once you have all of this information in hand, you can consider yourself ready for July 25. Stay tuned for our guide on how to vote on polling day! Very informative and helpful article..! @Hassan ................... You took the words right out of my mouth. ECP lists are non-searchable. Very difficult to find candidates in my constituency. Also, 8300 sms, does not tell which NA or PS constituency I've to vote for. It just give 'shumariati code' and silsila number which is again only helpful on election day. @Akhtar I think it should! I did the same, and it does say what constituency for both National and Provincial.